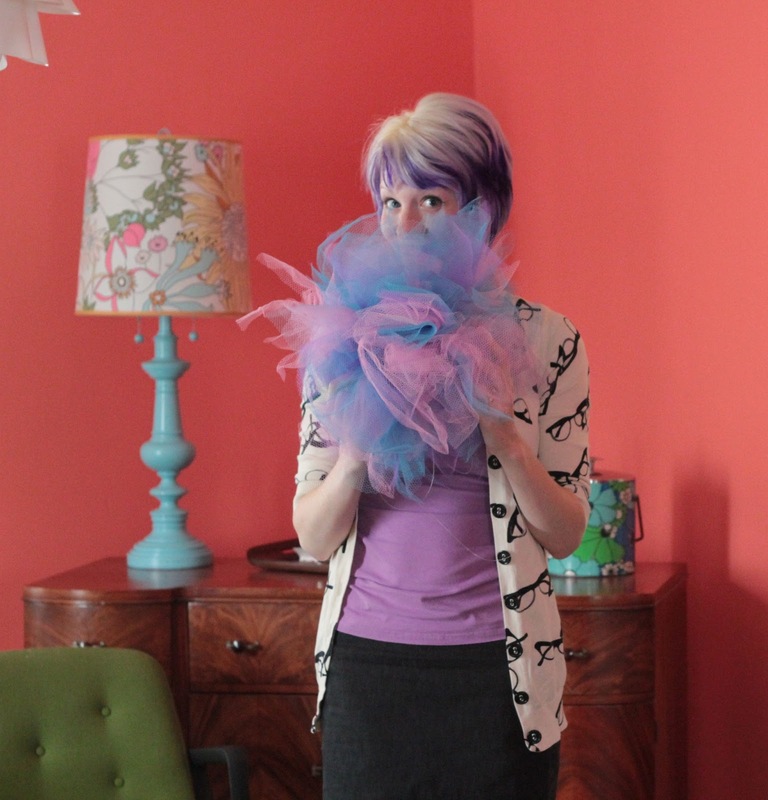 We’re so jazzed to share our interview with the talented Aubrey McClintock of a daily obsession! Aubrey puts her obsession with vintage and vintage-inspired fabric to perfect use creating bold and modern handbags and accessories. We’re so excited that she will be part of the 1st Annual Arts on the Square. Step into Aubrey’s bright and colorful world…. 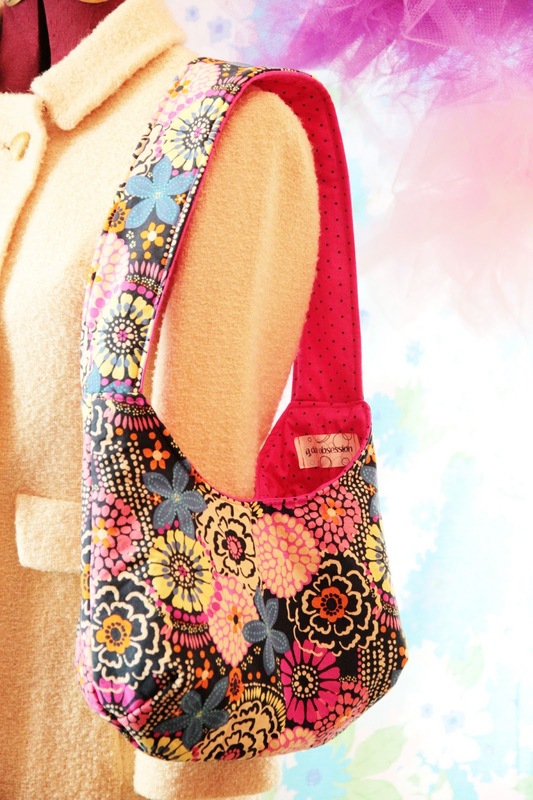 I have always loved bags, and colorful (almost verging on tacky) clothing and accessories—both new and vintage. I made my first large tote bag while waiting to go into labor with my daughter (I was late), and that was the beginning of my bag making adventure. She is now 4! I love the freedom you have when sewing—you can create what you want, using the materials you want, and make something totally you (or totally perfect for someone else!). I love all the items I make and lately have been doing quite a bit of custom work. My entire line is available on Etsy, and a small selection is carried at the Willow Tree Shop in Clarks Summit. I also do shows as much as I can. Forever ago I was in 4H and learned a little sewing. I was turned off by how perfect everything was expected to be, and was completely unexcited by the fabric choices. I dabbled making skirts, pillows, and curtains in college on a borrowed machine (my mom’s). Then, about 6 years ago, inspired by blogs, I decided to give sewing a try again—and that was it. What kind of materials do you use to make your products? How long does each piece take to make? I have a fabric problem. I love bold prints and am drawn to bright colors. I especially love when I can get my hands on vintage fabric. I also cut up crazy patterned moomoos and anything else that catches my eye. I am super lucky that family and friends pass fabric along to me and know that I am into vintage. I have an assortment of things that I make and some are faster than others. I can whip up a zip pouch in ten minutes while a complicated pockety bag might take over an hour. Although, honestly, with two little kids I rarely make anything in a completely linear manner. Vintage inspired, bold, bright, and not for the faint of heart. I am inspired constantly—blogs, people watching, books, movies (I will watch things solely for the sets and costumes), and Pinterest! My design philosophy is: everything is more fun when it is colorful; polka dots and animal print are neutrals; and clashing is simply a matter of opinion. 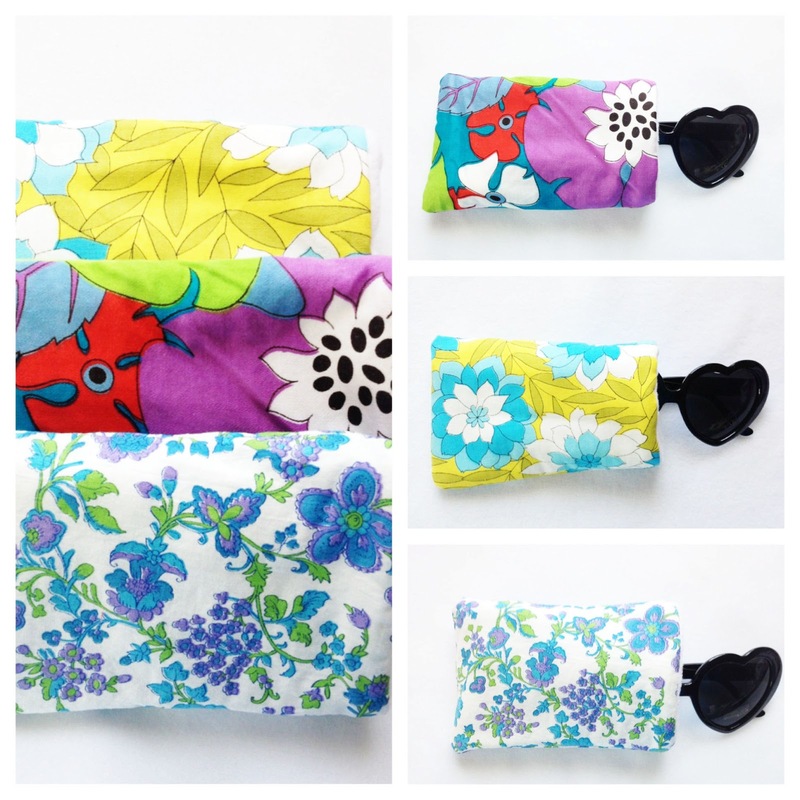 I will have bags of all sizes from zip pouches to purses to extra large totes. I also will have my upcycled vintage sheet lounge pants, yoga mat straps, fairy wands, fabric necklaces, key fobs, lanyards, yoyo hair pins, and bean bags! 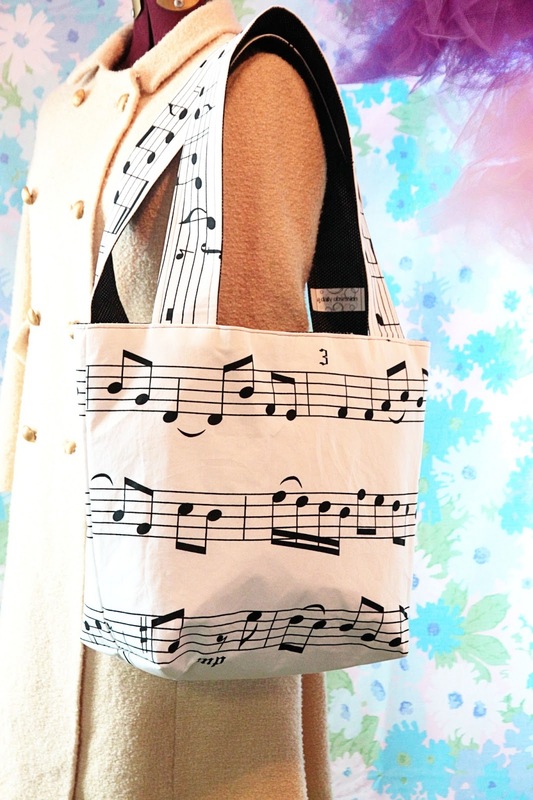 My extra large tote—it is super roomy, reversible (or can be customized with any number of pockets, key fobs, etc), and washable. They hold up extremely well—carrying diaper bag contents and teacher stuff for years. 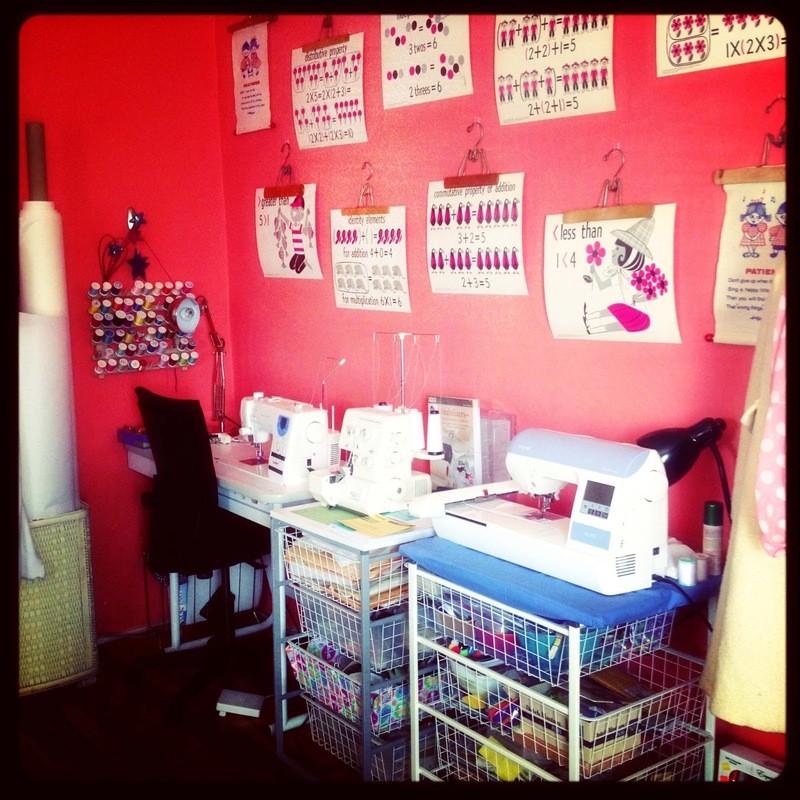 Sewing machine, cutting mat, rotary cutter and light—lots of light! 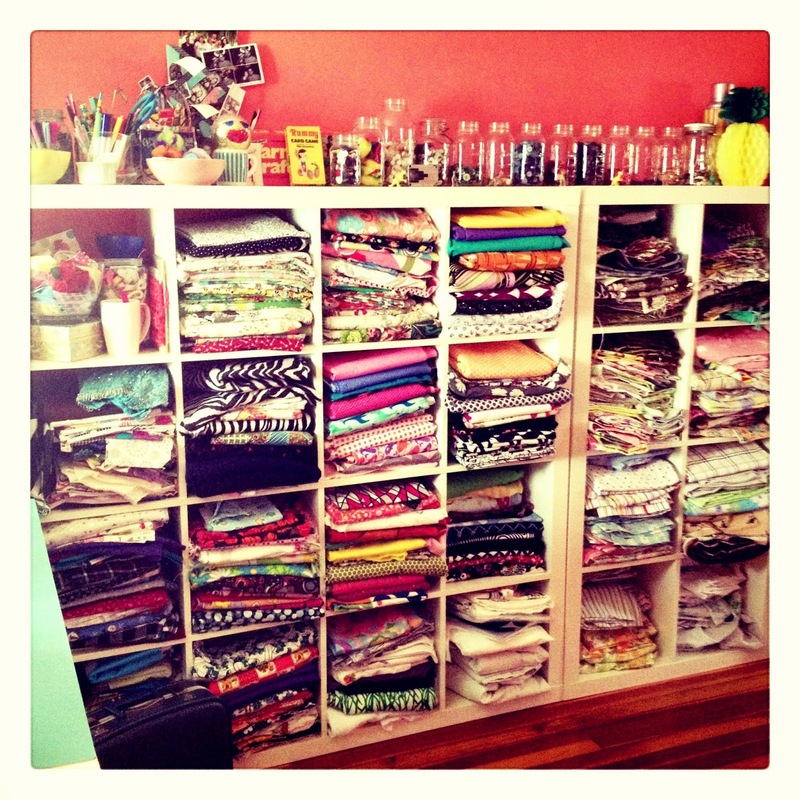 I have all my fabrics displayed on open shelving. I love to be able to look at them, and sometimes end up staring at the wall of color while imagining all sorts of combinations and styles in my head. I do try to keep it tidy enough that I can pop in and work on stuff when I have the odd minute, but it usually looks like a colorful explosion. Thanks, Aubrey for sharing with us!